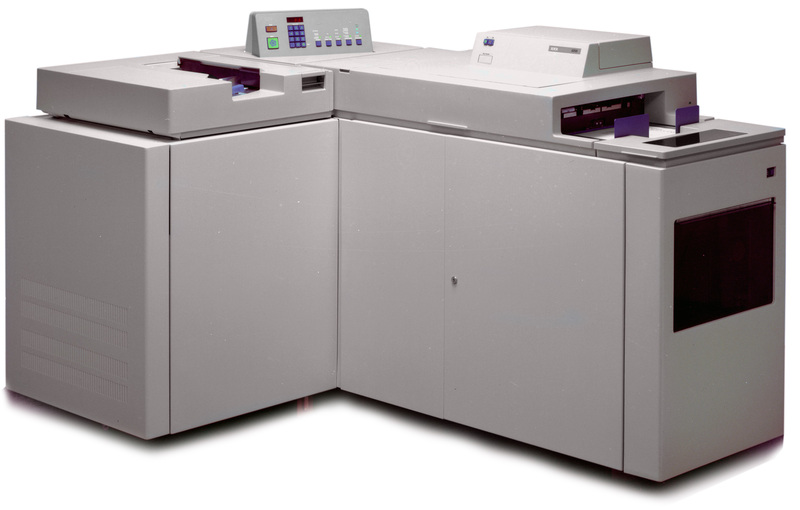 October 1979: Xerox started production of the Xerox 8200 copier/duplicator. The machine could produce high quality copies, like the Xerox 9500 could do. The code name for the 8200 was Chainsaw, according to a comment from Dana. Please read the complete comment from Dana, further down this page. The machine collated copies without a sorter. I remember this machine from when my mom started working for Dow Jones in the 80’s–it was probably one of the first things I knew as a “copy machine.” My elementary school, of course, had a copy machine, but it was inside the school secretary’s office and was off limits even to teachers who were stuck using the mimeograph machine in the teacher’s lounge. I remember this machine seeming very modern with it’s colorful, push button control panel and the smoked window to the paper compartment. Thanks for your comment on this blog. I have only seen this machine once, and I think it was around 1983. This machine was something similar to the Xerox 9400/9500, but it did not have any sorter like 9400/9500 had. I think the 8200 was also somewhat like inside as the 9400/9500. Anyway, I don’t think Xerox had much success with the 8200 on the market. Somewhere I remember reading that was considered their 2 1/2 generation technology. I remember TRW in California had one of these in a building during the mid 1980s with over 3 million copies on it. A great machine, built like a tank of mostly metal parts. It was maintained by someone who had worked prior in a offset press environment. She did her best to keep it maintained. The 8200 was, indeed, based on the 92/9400 frame, but designed to be more affordable. Xerox sold quite a few of these, but they required service more often and went down quite a lot. I was a field service rep in the 70’s and 80’s. In late 1980, the service training was two weeks in Leesburg, and you got trained on the 9500 and 8200 at the same time as the optics and xerographics were the same. The 9500 was for a production environment with a dedicated Key Operator. The 8200 was for a causual walk-up environment. The 8200 reliability was always much better in the dedicated Key Operator environment than it was in the walk-up environment! Keeping that set seperator finger working properly in the recirculating document feeder was key! This was interesting reading 🙂 Please send a photo of the 8300 to xeroxnostalgia@hotmail.com.